It took just one line of dialogue for the woman sitting beside me in new horror movie Us to bury her face in her hands and start whimpering “oh no, oh no”. It’s not normally a line of movie dialogue that would entice a cold stab of fear to plunge through your chest or force you to grip the slightly sticky arms of your cinema chair a little bit tighter, but thanks to the heavily circulated trailer for Us the entire audience alreday knew that line was the signal that the true horror was about to begin. In the opening scene of Us we are introduced to a little girl named Adelaide (Madison Curry), the year is 1986 and she’s enjoying a night out on the Santa Cruz boardwalk with her parents. While her father’s back is turned, she wanders off onto a dark nearby beach and finds herself in what looks like an abandoned beachside fun-house packed with mirrors. What she finds there in the darkness leaves her unable to speak for years. Flash-forward to the present day and Adelaide (Lupita Nyong’o) is now a mother of two and is being driven to her childhood home for a beach vacation by her husband Gabe (Winston Duke). Once at the holiday house, she visibly recoils when Gabe suggests they take their kids Jason (Evan Alex) and Zora (Shahadi Wright-Joseph) to the same beach where she wandered off that night, but finally gives in to her husband’s pleas to meet up with their friends under the condition that they return home before dark. Unfortunately, the evil she was hoping to avoid shows up at their house anyway, in the form of a terrifying family who look just like them. The home-invasion scene is bone-chilling and but also offers up a sense of grotesque relief. Up until now, the movie had been creeping along with a false air of normality, building up a creeping sense of dread, instead of just showing us the real monsters hiding in the dark and getting it all over with. Each one of the intruders is a near-identical twin of a family member, although it is only Adelaide’s twin we hear speak (remember that piece of information while watching the movie’s last scene…). Oscar winner Lupita Nyong’o worked with a voice coach to perfect the croaking, strangled tone in which her ghastly character uses to identify herself as Adelaide’s “shadow,” saying that she has lived a life of misery always “tethered” to her but far away. Then she states that she and the others have come to do some un-tethering, and it is really going to hurt. 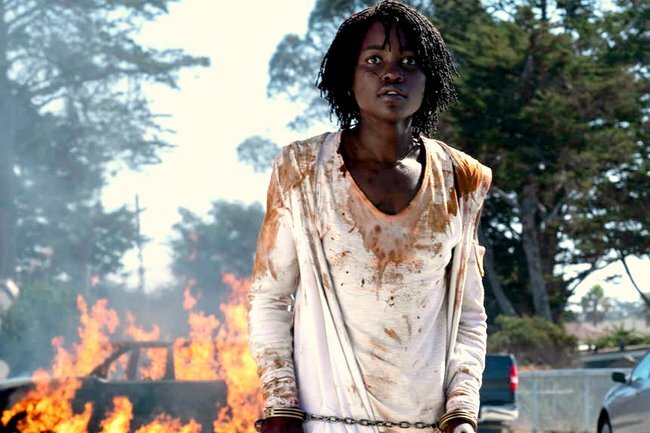 Us is both a brilliantly original horror film and a laugh-out-loud dark comedy, which is exactly what we should have expected from the mind of writer and director, Jordan Peele. While it does not offer up quite the same level of searing social comedy and satire that his hit debut film Get Out did, every single frame of the movie is layered with additional meaning and hidden messages. While a lot of horror movies have an unfortunate trend of placing their most horrifying moments in their film’s trailer, Us cleverly showed off many of it’s spine-tingling scenes in the marketing materials while saving some extra juicy gore for the main event. If you can walk out of Us and manage to not to wake up in a cold sweat at night, picturing Elisabeth Moss standing over you, then you are a braver person then I will ever be, as her character’s fate shows that this looming terror is not reserved for one family alone. On last word of warning. No matter what else you chose to do in life, do not Google the end of Us before you see it in a cinema. It’s one of those twisted endings that throws you off balance and forces the storyline to be reset completely in your head. I then suggest you go back and watch the film again because every plot point can now be viewed in a completely different light. While there’s plenty of guts and gore to be found in Us, it’s truest moments of terror will force you to confront your own reflection. Us opens in cinemas Australia-wide from Thursday, March 28. It is rated MA15+.